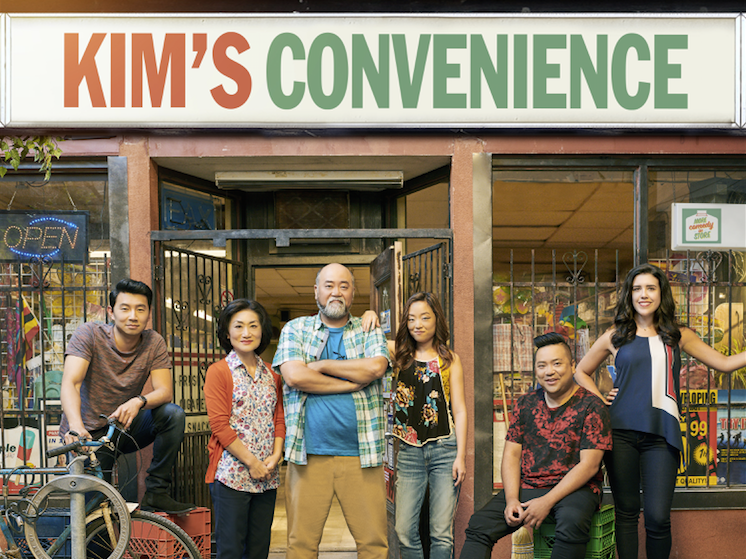 'Kim's Convenience' Is A Sitcom About Asian Immigrants — With Depth The Canadian television show, which centers on a Korean immigrant family in Toronto, is the country's first to have an all-Asian lead cast. Season 3 debuted Tuesday on the CBC. 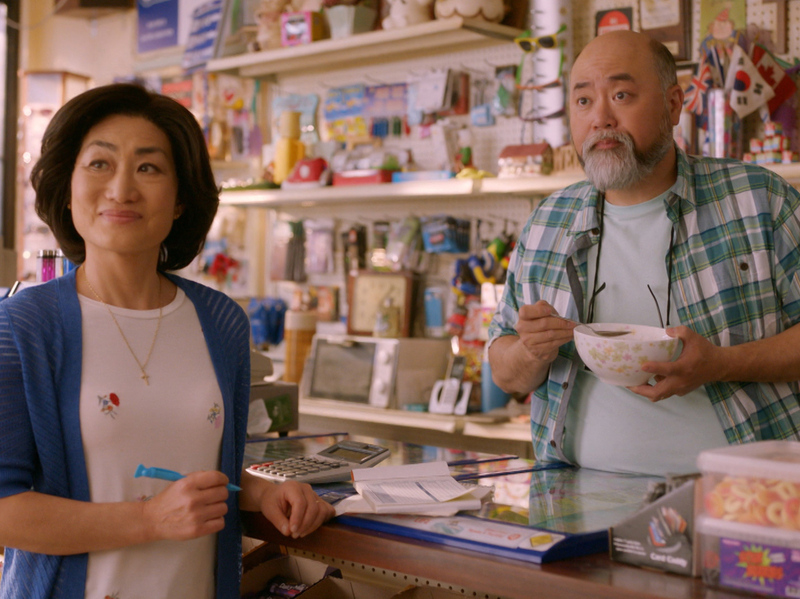 In Kim's Convenience, Umma (Jean Yoon, left) and Appa (Paul Sun-Hyung Lee) try to balance running their store and keeping up with their grown children. Season 3 of the CBC show debuts this week in Canada. The first two seasons can be streamed on Netflix. That's what the creators and cast of the hit play-turned-sitcom Kim's Convenience, the first Canadian TV show with an all-Asian lead cast, have striven for from the beginning. And as the series starts its third season, the CBC production has found lasting success in being both funny and deep. Creator Ins Choi, whose family moved from Korea and settled in Toronto when he was very young, started penning Kim's Convenience as a play in 2005. At the time, with his acting career off to a bumpy start, he was invited to join the playwriting unit at fu-GEN, a Toronto theater company dedicated to developing Asian-Canadian stories. "I came in with an idea: Write what you know," Choi says. At the same time, Choi also felt the stage was missing stories like his. "I wasn't seeing Asians on stage, I wasn't seeing Asian stories," he says. Indeed, Kim's Convenience -- from its setting in a convenience store in downtown Toronto, to the generational differences between the immigrant parents and their children, to the prominence of the Korean church — is infused with the parts of Choi's life that shaped him. "My father's a pastor. He used to be a pastor of an immigrant church in downtown Toronto," Choi says. "All my friends growing up in the '80s, '90s, their parents owned convenience stores ... I wanted it to be funny. My family's funny." The play took Choi about seven years to complete. It then became a hit at the Toronto Fringe Festival in 2011, which led to a years-long theater tour of Canada. Kim's Convenience was eventually adapted into a television show of the same name in 2016. The story centers on the Kim family — Mr. Kim (or "Appa," meaning father in Korean), played by Paul Sun-Hyung Lee; Mrs. Kim (or "Umma," meaning mother in Korean), played by Jean Yoon; and their two grown children, Jung and Janet, played by Simu Liu and Andrea Bang. The show draws laughs through the family's interactions with each other, and also with their multicultural community. Between Appa's antics or Umma's approach to parenting, the show is quippy and smartly written. The main cast of Kim's Convenience (from left): Simu Liu (Jung), Jean Yoon (Umma), Paul Sun-Hyung Lee (Appa), Andrea Bang (Janet), Andrew Phung (Kimchi), Nicole Power (Shannon Ross). Season 3 debuted on the CBC on Tuesday. But looking past its formulaic sitcom structure, Kim's Convenience also offers something else: well-rounded Asian characters who have depth. Whether it's the tense relationship between Appa and his estranged son Jung, or Janet's constant struggle to get her parents to support her photography career, there's no shortage of heavy story lines. Paul Sun-Hyung Lee says he was able to connect almost immediately with Mr. Kim's character. "I read the first two scenes, and my heart — it exploded because that was my appa," Lee says. "And I'd never heard him represented that way before — and it was like a key turning in my head, and his voice just started coming out." Lee, who also moved to Canada from Korea when he was very young, and whose father ran a store, says he has channeled people throughout his life for the role of Appa. He drew inspiration from strong characters in his community growing up, like people in the Korean church his family attended. He draws the character's temper from his umma because his appa "doesn't get mad." "He's very stoic, but when he does let loose, it's apocalyptic," Lee says. There was one problem. At the outset of the show, Lee says he couldn't do a Korean immigrant's accent. Actor Paul Sun-Hyung Lee accepts the Canadian Screen Award for best lead actor for his role in the comedy series Kim's Convenience. "And it was just a byproduct of denying my own heritage for so long, wanting to assimilate and be like all the other white kids," he says. "I just wanted to fit in with everybody else." Lee would go on to win the award for best actor in a continuing comedy series at the 2017 Canadian Screen Awards. And luckily, he says, his parents' only criticism of his performance as Appa has been his Korean. In Canada, like the United States, Asians are the fastest growing minority group. According to the latest Canadian Census, Asians make up almost 18 percent of the country's population. This is why it's important for viewers to see well-written and well-rounded roles for Asians, Lee says. He takes umbrage when people criticize the characters — especially their accents — on Kim's Convenience. Lee says they aren't playing stereotypes that begin and end with one trait. "They are archetypes," Lee says. "They are three-dimensional characters with wants, with hopes, with needs, with fears. And that's what's so exciting about playing them as an actor of color, because we've been so cut off from playing real people." This kind of drama-comedy approach to Asian characters is refreshing, says Nancy Wang Yuen, a sociologist and the author of the book Reel Inequality. Especially compared to U.S. family sitcoms with Asian-American families, she says. "They [U.S. sitcoms] tend to resolve everything in one episode," Yuen says, pointing to ABC's Fresh Off The Boat as an example. "And the humor, even when it takes on social kind of issues, they're more, I guess, light? And I think that Kim's Convenience takes on a little more complex layers." Yuen says she first heard about Kim's Convenience from her own community here in the U.S. So when it came to Netflix over the summer, there was already anticipation building. "When it finally came, I think people in the U.S. were just so excited to see yet another sitcom that seemed less clownish, that had kind of a tone that made people think," Yuen says. In Season 3, Ins Choi promises more of what the show is good at: smart comedy with authentic depth. But he also says the writers plan to expand the worlds of the characters and put them through more "high-stakes" situations. "It's a very, very funny season," Choi says. While watchers in the U.S. can binge the first two seasons on Netflix, the streaming service has not yet announced when Season 3 will be available. Ted Robbins edited the broadcast version of this story.